In celebration of the UAE National Day, Eton Institute wishes to promote the Emirati Arabic language and culture across the nation with the delightful gift of language. Dubai, 28th November 2016– His Highness Sheikh Mohammed Bin Rashid Al Maktoum, Vice-President and Prime Minister of the UAE, and ruler of Dubai, envisions the UAE as a center of excellence for the Arabic language in the region, a major aspect of the initiative ‘Vision 2021’ for the nation. He states that Arabic will continue to be a language of science and innovation owing to its flexible and culturally relevant nature. With widespread initiatives such as the Arabic Language Charter, ‘2016: The Year of Reading’ and the formation of an International Arabic Language Expert Committee, His Highness wishes to encourage the people of the country to expand their Arabic language knowledge and practice. 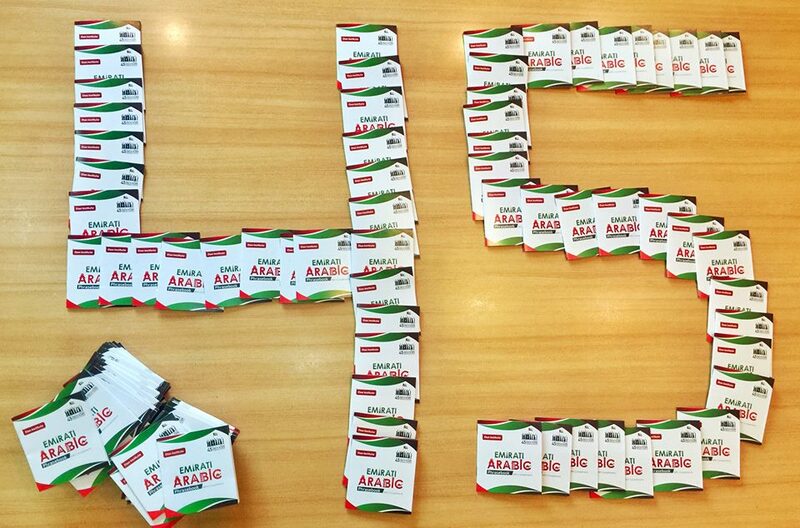 Supporting these initiatives to make the UAE the center of Arabic language excellence in the region, Eton Institute is distributing 2 million copies of its Emirati Arabic phrasebook in celebration of the upcoming 45th UAE National Day, on the 2nd of December, and the forthcoming Arabic Language Day on the 18th of December, to promote the culture, language and heritage of the nation. Previously having distributed 1 million copies in 2013, Eton Institute is widely spreading its reach across the UAE through many esteemed partners; Meydan Hotels, Emirates Driving Institute, Choithrams, GEMS Education, Dubai Health Authority, Jumeirah Group, Carrefour Time Out and many more. A study on Social Integration by a print media organization in the UAE, in collaboration with YouGov, (2015), suggests that approximately 59% of the expatriates and Emiratis surveyed agreed that expats should have knowledge of the Emirati Arabic culture, language and heritage. Moreover, almost 50% of them expressed that further engagements are required to preserve the culture and language of the UAE. Eton Institute’s pocket-friendly Emirati Arabic phrasebook will enable individuals to effectively communicate with the local community in the country and engage in supporting UAE’s vision for the future. Available for free across Eton Institute’s Dubai and Abu Dhabi branches as well as in schools and outlets of the above-mentioned partners, the Emirati Arabic phrasebooks will help learners bond with the UAE and everything it has to offer. For more information about this initiative and other cultural activities, visit middleeast.etoninstitute.com. Eton Institute operates with the understanding that languages, communication, and culture are fundamental to the human experience and necessary for individual and organization’s future success. Offering solutions in over 160 Languages since 2006, the Institute has helped thousands of companies resolve international bottlenecks through customized communication and culture solutions with operations in UAE, UK, USA, Hong Kong and India. Eton Institute has developed unique, proven engagement methodologies and techniques, and is proud to be associated with top international organizations and to successfully connect leading global business to opportunity. Eton Institute is an Approved Center for the delivery of Cambridge Exams. Additionally all language courses offered by Eton Institute are EAQUALS-accredited and meet Common European Framework of Reference (CEFR) standards set by Council of Europe.